An epic adventure that starts in the southernmost town of Argentina, Ushuaia, and winds through the wilds of Chile while taking in some of the best of South America's attractions. Tour Chile's Torres del Paine National Park, journey along the Chilean Fjord Coast, through the eerie landscape that surrounds the Pucon Volcano and finally arrive in the buzzing capital of Chile. Santiago is the final stop on this action-packed adventure through Patagonia, one of the most incredible places on Earth. Today we will drive to the world-famous Torres del Paine National Park. This is one of the most outstanding areas of natural beauty in the world and the main highlight of the trip for many of our passengers and leaders! We will stop en route in Puerto Natales to stock up on supplies and pick up our local guides and cook who will accompany us during our time in the National Park. Tonight we will camp at Las Torres Campsite, a stunning campsite inside the National Park with incredible views of the eastern side of the main mountain ranges which we will refer to as our 'base campsite'. Estimated Drive Time - 6-7 hours. INCLUDED ACTIVITIES Entrance into the phenomenal Torres del Paine National Park in southern Chile, an area of some of the most outstanding natural beauty, breathtaking mountain vistas, and idyllic trekking opportunities in the world : Included in Kitty About Torres Del Paine National Park: Torres del Paine National Park contains what is undoubtedly some of the most spectacular mountain scenery in the world. 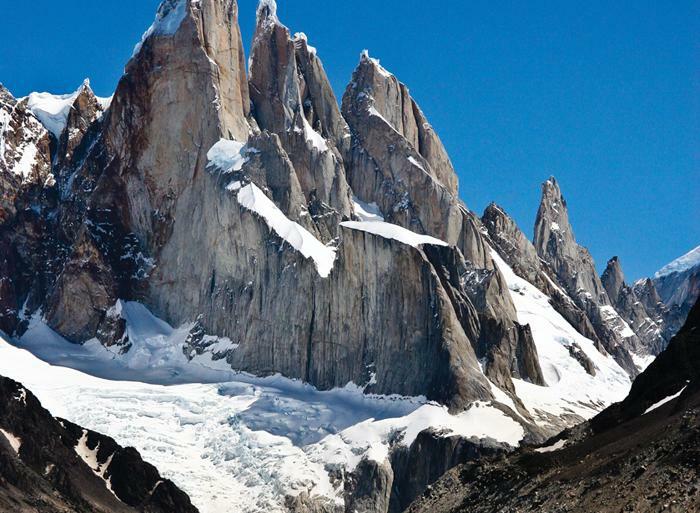 Rising up high above the Patagonian steppe are the three impressive granite towers that give the park its name, surrounded by high plateaus and towering mountain peaks, the most famous of which are Los Cuernos and Paine Grande. The park is a magical natural wonderland full of deep lakes, sparkling glaciers and cascading waterfalls, and it is also an important habitat for a wide variety of wildlife including guanacos, pumas, flamingos and condors. The best way to explore the National Park is definitely to get out on foot - the region is criss-crossed by a good network of trails, making it possible for you to see all the main sights either by doing a series of day hikes or embarking on a multi-day walk such as the famous W-walk, stopping off at the park's Refugios or camping along the way. Horse riding and kayaking can also be arranged locally, and boats and catamarans offer trips across Lago Grey and Lago Pehoé in season. Up to August 2018 this trip will run as follows: Dragoman offers two options for your time in Torres Del Paine National Park: - Option 1 - Base Package - included on all trips our trips as standard is a guided trek on our first day to the stunning three peaks viewpoint, followed by three free days to enjoy the National Park and take part in optional activities. - Option 2 - Full W-Walk - optional upgrade to embark on the full W-Walk with a local guide. Places at the campsites are limited by the National Park, so it is essential that you pre-book this option with your sales agent before your trip as it is not possible to book on arrival. Today we will all have an included guided trek from our base campsite to the breathtaking viewpoint of the famous three peaks which give the National Park its name. After taking in this incredible view, we will trek back to our base campsite for the night. Approximate walking distance: 20 km, estimated time: 8 hrs. INCLUDED ACTIVITIES Base package Guided 'base package' to trek part of the famous W-walk - included is the trek to the towers of Torres del Paine with an expert local guide, and accommodation, food and a cook at Las Torres Campsite : Included in Kitty. OPTIONAL ACTIVITIES W-walk extension The extension package is to include the entire of the famous W-walk in Torres del Paine - included are two extra nights camping on the trail with facilities, food for the duration of the trek, and the service of an expert English speaking local guide. Please note that this package must be prebooked in advance through your sales agent. Please book as early as possible to ensure availability and avoid disappointment! For further information on the W-walk please refer to the detailed trip notes. From September 2018 onward the W-Hike will be included in the price of the kitty and this itinerary will run as follows: Embark on the full W -Walk with a local guide. Places at the campsites are limited by the National Park, so we book them in advance of your trip. We will be trekking the W-Walk from West to East, to enjoy the spectacular views. This morning we will wake early and transfer by truck for the morning Catamaran, to cross Lago Pehoe. We will then set up camp at Paine Grande, before continuing on our hike towards Glacier Grey. You can choose to hike to the first look out to enjoy views of the Glacier (approx 4hrs round trip) or to continue to the second look (approx 8hrs round trip)!! Both walks return by the same route. Base package group: Today is a free day for those that have not booked the optional W-walk extension package. There are many short walks and other fantastic optional activities available near our base campsite, or alternatively it's a great day simply relax and enjoy the spectacular views from the campsite. W-walk extension group: If you have chosen the optional W-walk extension, you will leave our base campsite today to continue your guided trek along the edge of Lago Nordenskjöld to Los Cuernos Campsite where you will camp for the night. Approximate walking distance: 11 km, estimated time: 5 hrs. OPTIONAL ACTIVITIES Take in the stunning views of Torres del Paine on a horse riding trip through the National Park : CLP 30000 Head out on a fantastic boat trip on the Grey Lake to get up close to the colossal Grey Glacier : CLP 55000 From September 2018 onward the W-Hike will be included in the price of the kitty and this itinerary will run as follows: Today we depart from our camp at Paine Grande and hike into the stunning French Valley. In the afternoon, we will make our way to Camp Cuernos. The hike is approximately 8 hours. Base package group: Today is another free day for optional activities for those that have not booked the optional W-walk extension package. W-walk extension group: If you have chosen the optional W-walk extension, you will leave Los Cuernos and trek up the French Valley with your local guide. From here you will continue trekking to Paine Grande Campsite where you will camp for the night. Approximate walking distance: 27 km, estimated duration: 11 hrs. From September 2018 onward the W-Hike will be included in the price of the kitty and this itinerary will run as follows: Today we have a slightly easier day, we will hik e from Camping Cuernos along the edge of Lago Nodenskjold, around Almirante Nieto and stay just outside Valley Ascencio. We will arrive an Camp Central after approximately 5 hours hiking. Today is our last full day in this beautiful National Park. Base package group: Today is another free day for those that have not booked the optional W-walk extension package. W-walk extension group: If you have chosen the optional W-walk extension, today will be the last day of the W-walk. You will trek with your local guide along the edge of Lago Grey to an excellent viewpoint over the spectacular Grey Glacier. You will then trek back to Paine Grande and board the catamaran across the Lago Pehoé, where you'll be met by our Dragoman truck and driven back to our base campsite for the night. Approximate walking distance: 22 km, estimated duration: 8 hrs From September 2018 onward the W-Hike will be included in the price of the kitty and this itinerary will run as follows: This is our final day of the W-Walk and the most spectacular. The day begins with a steady climb from our camp site up Rio Asencio. Be prepared for the final hour which is a relatively steep scramble up to the Tarn and Mirrador Las Torres, affording great views of the iconic Towers. We will transfer back to Camping Pehoe, our base camp at the end of the day. Our hike today is approximately 8 hours for the return trip (16km). Border information: Exit Chile at Cerro Castillo, enter Argentina at Cerro Castillo. Today we leave Torres del Paine behind us and head across the border to the town of El Calafate, the gateway to the Perito Moreno Glacier. In El Calafate we stay in dorm beds in a lovely hostel. Estimated Drive Time - 8-9 hours. About El Calafate: El Calafate is a small town on the southern shore of Lago Argentino in Patagonia. Originally a sheep station and trading outpost, today the town has developed a bustling atmosphere and an ever-growing tourist trade. Interestingly the town takes its name from the Calafate berry, and locals claim that if you eat one of these and make a wish, you are guaranteed to return to Patagonia. Most people base themselves here to visit the nearby Perito Moreno Glacier, located a short distance away at the southern reaches of the Los Glaciares National Park - the glacier is one of the most famous and spectacular glaciers to be seen anywhere in the world. The Perito Moreno Glacier is approximately 30kms long from where it spills out of the Southern Patagonia Ice Field, and 5kms wide at its terminus, where it has a ice face that is on average 170m high (with about 70m of which is above the surface of the lake). Visitors can view the glacier from an incredible viewpoint only a few hundred metres away from its face, where if you're lucky you'll see some of the ice face carve off into the lake under the pressure of all the ice behind it! It is also possible to take a boat trip to get extremely close, or embark on a challenging ice-climbing expedition on the glacier itself. Today we have a short drive across the Patagonian steppe to the tiny town of El Chaltén, situated in Los Glaciares National Park and famous for its incredible mountains, glaciers and world-class trekking opportunities. In El Chaltén we stay in dorm beds in a hostel. Estimated Drive Time - 3-4 hours. About El Chaltén: El Chaltén is small remote Patagonian town nestled under the shadow of the iconic Mt. Fitz Roy. The town itself has an interesting origin - the area was disputed between Argentina and Chile for a number of years, so the Argentinians thought they would settle the argument by hastily building the town of El Chaltén in 1985 to claim the territory! The name of Chaltén comes from the Tehuelche word for 'smoky mountain', so called as the early morning clouds gathering around Fitz Roy look remarkably like volcanic smoke. However, the town has grown immensely in recent years and decades, becoming a major centre for adventure tourism in Argentina. It is a fantastic base from which to explore the northern sections of the incredible Los Glaciares National Park, and is home to many adventure tour operators offering outdoor activities in the area. ( Day 11 to 12 ) We will have three free days to enjoy the stunning Los Glaciares National Park and the incredible scenery of the nearby Mt. Fitz Roy. There are lots of trekking and walking opportunities here, as well as boat trips, ice climbing on the Viedma Glacier, horse riding, and many other fantastic options. OPTIONAL ACTIVITIES Head out horse riding around the phenomenal scenery of El Chaltén : ARS 600 Freely explore and trek around the walking trails of Los Glaciares National Park, taking in the marvellous vistas of the Fitz Roy mountain range : Free Take a boat out onto the stunning Viedma Lake, and get up close to the Viedma Glacier to see its impressive facade (with options to do some ice trekking on the glacier!) : ARS 1870 Enjoy an exhilarating day of ice trekking and climbing on the Cerro Torre Glacier, dramatically located at the base of the impossibly-steep spire of Cerro Torre : USD 74 Visit the majestic Lago del Desierto, a remote and serene lake surrounded by stunning forests and mountains : ARS 500 About Los Glaciares National Park: Los Glaciares National Park is the largest protected area in Argentina, covering a huge area of Argentinian Patagonia along the southern tail of the Andes range. The National Park is home to some of the most spectacular scenery in all of South America. This is classic picture book Patagonia, and wherever you turn you're surrounded by wide open skies, magnificent mountains, incredible glaciers, glistening lakes and thick verdant forest. By far the best way to explore is to get out on foot - there are plenty of well-established trails through the mountains and forests of the National Park that are easy to explore independently with a map, so you can plan many treks around the area from around two hours to an entire challenging day out. As well as the phenomenal needle-like Cerro Torre, the iconic mountain of Fitz Roy looms over our base of El Chaltén, an impossibly-picturesque and steep mountain (which is also the logo for the 'Patagonia' clothing brand!) which can be viewed from many angles on treks in the area. Other activities can include boat trips and ice climbing on the incredible Videma Glacier, a visit to the serene Lago del Desierto, and horse-riding excursions through the incredible landscapes. Today we will have a full day drive north along the famous Ruta 40 (Route 40). Please note that the road from here all the way to Futaleufú is rough and mostly unpaved meaning that the going is slow. Tonight we will wild camp somewhere near the town of Perito Moreno. Estimated Drive Time - 10-11 hours. About Argentinian Patagonia: Patagonia is the name of the region in the far south of South America, the southernmost stretch of the Andes and the surrounding plains and plateaus. The area is split down the middle by the Andes, with Chilean Patagonia on the west, and Argentinian Patagonia on the east. Renowned for its desolate landscapes, unrelenting winds and magnificent lake, mountain and glacial scenery, the name Patagonia comes from the word "Patagon", used by the explorer Magellan to describe the local people who he believed to be giants. Today historians believe that the Patagons were actually Teheulches, with an average height of about 1.8m as opposed to the average height of a Spaniard at the time of 1.55m! Argentinian Patagonia includes the spectacular national parks of Los Glaciares, Nahuel Huapi and Tierra del Fuego, home to the Perito Moreno Glacier, the Argentinian Lake District and the Fitz Roy range. Border information: Exit Argentina at Ingeniero Pallavecini, enter Chile at Puerto Ingeniero Ibáñez. Today we will drive across the border into the magnificent scenery of the Chilean Carretera Austral, probably one of the most stunning areas in South America. We will arrive in the beautiful mountains of the Cerro Castillo National Reserve. In Cerro Castillo we will camp in a lovely family-run campsite with basic facilities. Estimated Drive Time - 6-8 hours. About Cerro Castillo National Reserve: The Cerro Castillo National Reserve is a nature reserve near the southern section of the Carretera Austral, famous for its rugged landscapes centred around the photogenic rocky mountain of Cerro Castillo. There are abundant lenga tree forests and several mammals in the area such as South Andean deers and guanacos, and birds including Austral parakeets and Andean condors. About Carretera Austral: The Carretera Austral (meaning Southern Highway) is a fantastic route that passes between Puerto Montt and Coyhaique, through vast tracts of untouched wilderness, past soaring snow-capped mountains, glaciers, glass-green fjords and staggering, beautiful valleys. This is Chile at its best and is a perfect area to explore by overland vehicle, driving through magnificent scenery in this area of outstanding natural beauty. After spending some time this morning at Cerro Castillo, we will drive through the Chilean fjords to Queluat National Park. Estimated Drive Time - 5-6 hours. The following day we will have included entrance into the National Park, with options of walks to see the spectacular Colgante Hanging Glacier. In Puyuhuapi we will camp at a basic campsite. INCLUDED ACTIVITIES Visit the stunning Queulat National Park, and take a trek through the 'Enchanted Forest' to view the magnificent Colgante Hanging Glacier : Included in Kitty About Puyuhuapi and Queulat National Park: Puyuhuapi is a small village in Chilean Patagonia along the Carretera Austral, and is the gateway to the Queulat National Park. The National Park is dominated by the Patagonian Andes, and it covers a large section of the Puyuhuapi Volcanic Group south of Lake Risopatrón. There are two small ice fields in the National Park with glaciers of up to 12kms long, including the centrepiece Queulat Hanging Glacier, which spills out over the edge of a cliff and has a waterfall of melt water pouring from its base. The park is also full of temperate rain forest comprising mainly of coihue and tepa trees, and has a large variety of birds such as the Magellanic woodpecker. ( Day 15 to 16 ) After spending some time this morning at Cerro Castillo, we will drive through the Chilean fjords to Queluat National Park. Estimated Drive Time - 5-6 hours. The following day we will have included entrance into the National Park, with options of walks to see the spectacular Colgante Hanging Glacier. In Puyuhuapi we will camp at a basic campsite. INCLUDED ACTIVITIES Visit the stunning Queulat National Park, and take a trek through the 'Enchanted Forest' to view the magnificent Colgante Hanging Glacier : Included in Kitty About Puyuhuapi and Queulat National Park: Puyuhuapi is a small village in Chilean Patagonia along the Carretera Austral, and is the gateway to the Queulat National Park. The National Park is dominated by the Patagonian Andes, and it covers a large section of the Puyuhuapi Volcanic Group south of Lake Risopatrón. There are two small ice fields in the National Park with glaciers of up to 12kms long, including the centrepiece Queulat Hanging Glacier, which spills out over the edge of a cliff and has a waterfall of melt water pouring from its base. The park is also full of temperate rain forest comprising mainly of coihue and tepa trees, and has a large variety of birds such as the Magellanic woodpecker. Today we continue to the rafting mecca of Futaleufú. In Futaleufú we stay in a local campsite. Estimated Drive Time - 5-6 hours. About Futaleufú: Futaleufú is a serene frontier town in the northern part of Chilean Patagonia - its name comes from the swirling river that passes by the town, which means "Big River" in the Mapuche language. The town is becoming increasingly popular with travellers through Patagonia due to its wonderful scenery and outdoor activities in the area. Border information: Exit Chile at Rio Futaleufú, enter Argentina at Rio Futaleufú. Today we continue our journey to the picturesque town of Bariloche in Argentina's Lake District. In Bariloche we stay in dorm beds in a friendly family-run hostel outside of town. Estimated Drive Time - 7-8 hours. About Bariloche: The Argentinian resort town of Bariloche has a picture perfect setting on the shores of Nahuel Huapi Lake, flanked by the peaks of the surrounding Andean mountains. The scenery here is truly stunning, so it's a magical place to explore and take in all the amazing views. In winter, the town is a popular centre for skiing and in summer the focus shifts to walking, mountain-biking, horse-riding and kayaking and canoeing on the lakes - and if all that sounds too much like hard work, you can sit back and enjoy the view on a leisurely boat trip across to Victoria Island. Bariloche itself is also an interesting place to wander around. The town is famous for its handmade chocolates, and there are some really spectacular displays in the local chocolate shops. Because of it's popularity with Argentinians as well as international tourists, the town has a lively bar and restaurant scene with some great places to choose from. This is a particularly good place to sample some world-class Argentinian steak, and wild boar and Patagonian lamb is also worth a try here too! Border information: Exit Argentina at Mamuil Malal, enter Chile at Mamuil Malal. Today we will drive through the scenic Ruta de los Siete Lagos (Seven Lakes Route) to the beautiful Lake District of Chile and the lakeside town of Pucón. In Pucón we will stay in dorm beds in a friendly local hostel. Estimated Drive Time - 10-11 hours. About Pucón: Southern Chile's lake district boasts some lake and mountain scenery comparable with what the Swiss Alps or New Zealand have to offer! Beautiful deep blue lakes are flanked by majestic forest-clad mountains with snowy peaks to provide picture-postcard views and a perfect spot for walking and camping. The attractive small town of Pucón is located at the heart of the Chilean lakes, a great place to stop for a few days so you can explore the area and get involved in some of the many adventure activities on offer here. At certain times of year it's even possible to do a day climb of the nearby Villarrica volcano - a challenging trek, but one that anyone who is reasonably fit should be able to manage - and you're rewarded with some fantastic views of the surrounding area from the summit. The whole area is great for trekking and there are plenty of options to do some fantastic self guided walks. Alternatively Pucón offers great horse riding, white-water rafting and mountain-biking opportunities. For those who would prefer to relax, there are also some great thermal springs nearby - the natural pools at Pozones have a beautiful setting and are a great place to go and soak your weary limbs in the evening! Today we have a full day drive north along the Pan American Highway to the cosmopolitan Chilean capital of Santiago. In Santiago we will stay in a centrally-located hostel. Estimated Drive Time - 11-12 hours. About Santiago: Chile's capital, Santiago, is a large, modern city with a very European atmosphere. In the centre of the city, wide tree-lined boulevards lead to pleasant plazas and leafy parks, and on a clear day the snow-capped peaks of the Andes provide a magnificent backdrop to the Santiago skyline. Much of the centre is pedestrianised, which together with the wide streets and efficient metro system make Santiago an easy city to explore on foot. There are plenty of interesting museums where you can learn more about Chilean history and culture, from the City of Santiago Museum which chronicles the city’s history, to the Natural History Museum and Museum of Pre-Colombian Art. The city's many wonderful parks are also worth a visit, particularly O'Higgins and San Cristóbal which offers great views of the city from Cerro San Lucia. As you would expect from a capital city of this size, Santiago is full of busy bars and restaurants and has some lively nightlife to offer. For cheap eats full of local flavour, head to the Mercado Central which is packed full of food stalls and simple cafes and restaurants. For a real treat, you might want to head out to one of the more upmarket neighbourhoods like Bellavista or Providencia, home to some really world-class restaurants and great bars. Barrio Brazil is also worth a look; this old neighbourhood attracts an arty and bohemian crowd and there are often interesting events going on here. If you have the time, there's also plenty to do in the area surrounding the city. Santiago is right in the middle of Chile's wine producing region, so it is relatively straightforward to arrange full day or half day tours out to the local wineries. You may also be interested in visiting the seaside town of Valparaíso, which can be visited as a day trip from Santiago.